How important is research in your social media strategy? There is one thing that all social media strategies or campaigns have in common. This one simple thing that actually differentiates one campaign from another. And many marketers forget about the importance of research in social media. They believe that if they know something about social media, went to a social media conference and watched a few webinars, they are good to go for a successful social media campaign. And I found myself sometimes in this mirage of knowing everything about social media. How hard can it be to post on Facebook? How hard it is to use a certain hashtag on Twitter or Instagram? How hard it is to record a video on YouTube? Well, before we go into this topic we need to have some knowledge about the industry, about our brand and let’s not forget about our community. And how do you know all these things? You start doing your research. Research is the key factor of a great and successful social media strategy that brings you the results you want. Research is what makes the difference between a good social media strategist and a bad one. Research should be your social media strategy’s foundation. I believe that a smart marketer does research every day on social media. In fact, research should be a lifestyle for a social media marketer. When they scroll on Facebook, swipe on Snapchat or Tinder, RT on Twitter or subscribe on YouTube.All of this should be in the name of research. Let’s focus a little bit on the audience. In fact, this is not the technical article you want to read if you do paid social media ads. It’s the kind of article you want to read before you create a social media strategy for your brand. It doesn’t matter if it’s a buyer persona, user persona or whatever. You have to know who is your ideal customer. John Lee Dumas talked about this topic in an interesting interview and put them all together as a “Business Avatar”. That means that you need to create a fictional persona of your customer, from naming it, knowing what he/she is having breakfast, what it does on the weekends. This is a great exercise before you create a social media strategy. In this article I want to show you what you can do as a marketer to start researching for your brand and what metrics you should look at to create a results driven social media strategy. I’m not a SEO guy but I’ve learned a few things from the good ones. And one of them is the importance of keywords. Before I write a B2B blogpost or before I start thinking about a plan for a content marketing strategy I always look at the keywords. Some of you may say that keywords are only used in SEO, but from my experience I can say that they are used in almost every aspect of the content strategy, including social media too. For example, let’s talk about how I started looking at keywords for Bannersnack in social media. First, I looked at the branded keywords – that includes searching on the top social media networks for keywords like “bannersnack” and see who used the word and why. I went to Twitter and wrote in the search bar the word “Bannersnack” and looked at the latest and most popular tweets. Then I moved forward and started looking at keywords from the industry and other keywords that are relevant for the brand, keywords like: banner ad, banner ads, display ads, display advertising, social media ads and others. How did I find these keywords? I used 2 simple tools that every digital marketer should know about in this century: Keyword Planner from Google Adwords and Moz Explorer. Yeah, I know, these are the tools that only advertisers, PPC or SEO guys are using, so why would a social media manager use them? The answer is simple. They will help you broaden your area of interest in your industry. That means that maybe there is a discussion on a certain topic in your industry, but you didn’t know about it because you are we’re not following that topic. So, how do you find the keywords you should research for your brand on social media? Let’s try with an example. Yes, you can go further with your keywords but it’s important to stay relevant to your core keywords and understand that you are doing this research to create a successful social media strategy. But now that we know what keywords we want to research, what else should we look next when we do our research? Don’t forget about your competition. They are also key factors for your social media strategy. Just follow them and see what they are doing. How they communicate with their audience. What kind of content they create and when they are posting it on social media. Yes, you can be a competition stalker 🙂 and sometimes it’s the best tactic you can embrace to have a better social media strategy for your brand. Stalking your competition is not a bad thing. All you have to do is just be more interested in what they are doing, how they are doing and how the interact with their customers. Competition is good for the industry and also good for social media. Now let’s move forward and see how we can do research to create a better social media strategy. Almost every top social media platform has it’s own search bar. 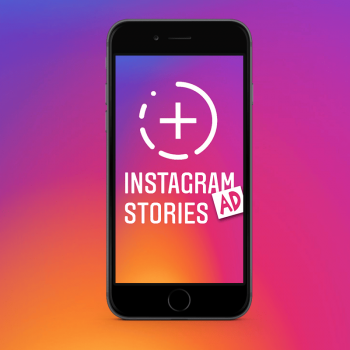 In fact, I wrote about how important is this feature for every social media marketer and how few of them are using it. If you go on Facebook you will see that at the top of the social platform is a bar with the “Search” headline. There is the space where you should use these keywords. And it’s also the same thing with Twitter, Instagram, Linkedin, Pinterest or SlideShare. Here you can see who mentioned your brand, who is talking about a certain topic in your industry, find new ideas, jump in conversations or other stuff that can help your social media strategy (even if they didn’t use the tag feature or the “#” hashtag one). It’s as simple as you can just try it right now. Quora is another great social media tool with the help of which you can see what questions people have about your industry and what are their biggest struggles. A great tool I’m using to find the influencers who are “playing” in a certain industry is Buzzsumo. All I have to do is to go to the “Influencer” feature and enter a topic, keyword or @username to search bios. 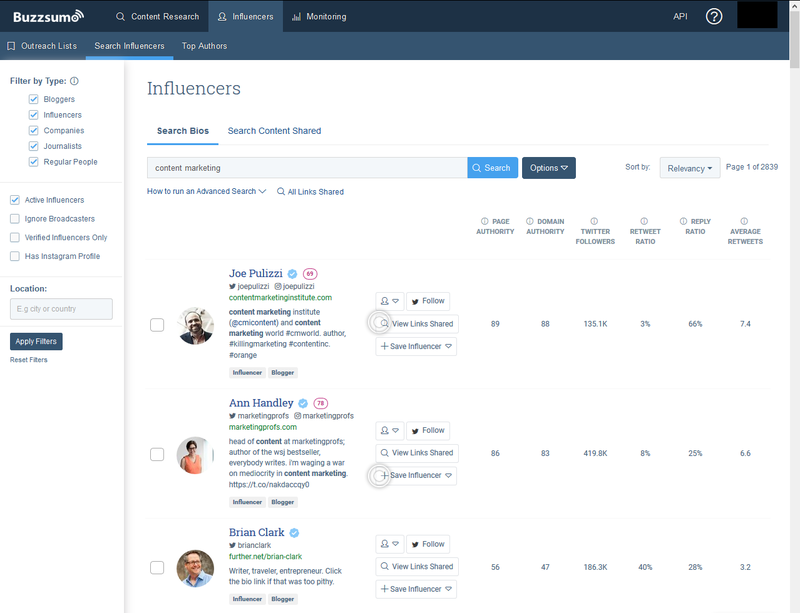 This Twitter influencer feature will allow you to find the key influencers in your industry and follow them directly within Buzzsumo or add them to your Twitter lists. Or if you have an author or blogger in your mind that you want to see what are their top most shared articles, what kind of article he/she writes, just go to the “Top Authors” feature and type his/her name in the search bar section. 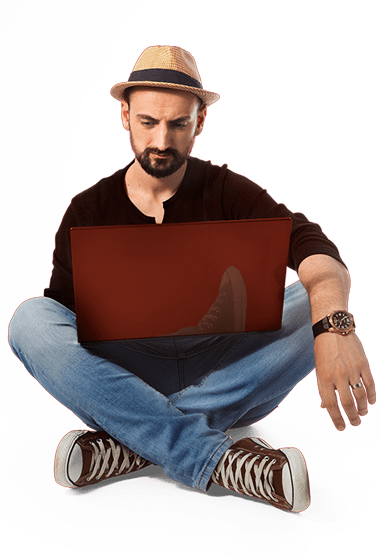 Here you will get results as name, Twitter account, how many articles he/she has published lately and what are the top pieces of content he/she has created. This is a great tool to start your research if you want to increase your popularity among bloggers and social media active users. Starting an influencer marketing campaign can be a good strategy for your brand. Maybe you want to get a few backlinks or you want to grow your brand awareness. Some of the influencers are the big players in the blogging community and some of them are the not-so-known bloggers who are trying hard to grow a bigger community, gain more web traffic so they can stay at the big-players table. But it is not important how big or small the blogger is for your research. This will help you see what other influencers talk about your brand or your industry. For example, in the fashion industry there are tremendous fashion bloggers who are not only taking pictures in their new outfits but they are also talking or writing about their clothes, their lifestyles and are engaging on social media with their communities. If you are in the fashion industry, they are a great example to see if they are talking about your brand, if they are using your product and what their communities think about you. This will also get you closer to an influencer and help you start a campaign with him or her. Many marketers believe that what bloggers say about a product or service is pretty important. Well my friend, let me tell you that there is one other part that is even more important. That part that is important for the blogger himself. A brand is as important as the opinion of the blogger that wrote the article or created the post. So in that situation you can research about transparent opinions and get some great insights for your brand and social media strategy. For example, you can start a campaign with the medium influencers in your industry who are also having a blog. Talk with them about your brand or service and ask them if they are interested in writing about your industry. If they are willing to do this, give them the right resources they need, maybe some new data, new information and some cool stuff they can use in their articles. You are not interested in mentioning your brand here or getting some exposure. Your focus is on the blog comments. What people are interested in the industry. What they are talking about. What are the most common questions. Do a research, put them all together and work with the influencer to write another article, or create a video or just update the article with some new stuff and see if they can now mention your brand. Also, you as a brand have the opportunity to reply to these comments and let them know that you are there and you want to hear their voice and help them. I believe that almost every niche had a well known forum at one point. Even if social media is getting bigger and bigger, there is always a place for forums. I found myself learning a lot from the people on a marketing forum. I’m a big consumer of 2 forums on which I spend almost every morning. I love the interaction of inbound.org and the content that is shared on growthhackers.com. And I also found a lot of new stuff during my research for a new social media strategy. Why? Because forums are still alive and kicking with people that are interested to help communities and industries. For example, if you work for a flower shop look on the internet and find the forums that talk about flowers, go there and start looking for the subjects that people are most interested in. Maybe they are interested in the seasonal flowers or maybe they want to find out more DIY (Do It Yourself) flower arrangement tips. Forums are also a great place where you can find what people really think about your brand. When you listen more, you can give more back. So in this article I’ve shown you what keywords you should look at, how to find your own keywords, where to research these keywords and where to find topics and subjects from your industry. Now back to you, let me know what research tactics you use to create a social media strategy in the comments section below!